Windows needs to download and install a software driver from the \<servername> computer print to <printer-name>. Proceed only if you trust the \<servername> compuer and the network. 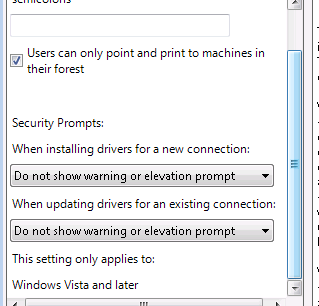 You might see above message with “UAC” prompt to install drivers while adding network printers from a windows 7 computer. 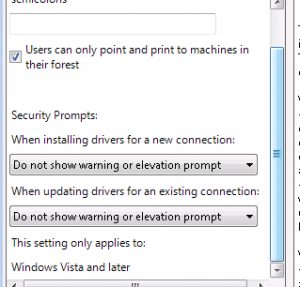 This behavior is expected as normal users are not allowed to add network printers(drivers installation requires admin rights) in a Windows 7 environment. To fix this, you need to enable below group policies with described settings. Computer Configuration -> Administrative Templates -> Printers -> Point and Print Restrictions and it’s settings should look like below. Before reaching this policy setting, I have gone through the options to allow device and class ID/GUIDs through GPOs(click here for details) but in vain as they are not fully developed for printers. Is this for server 2008 domains only? Is there any way to deploy this settings to Win7 machines in server 2003 domains, as I have started deploying a few Win7 machines on our domain which is a Windows 2003 native domain. Only thing you have to do is…. 3. Create a new GPO and link it to windows 7 computer OU if you have created a dedicated one.